/ CONTEXT The project consisted of the demolition of a 2100 square meters steam plant with an overall height of 20 meters; an associated 100 meters concrete chimney; and other ancillary structures such as two pump houses, which were located along the shoreline of Lake Huron. / DECOMMISSIONING The work, which was conducted in an operating nuclear facility, was closely coordinated with the general contractor and performed in accordance with stringent health, safety, and environmental protocols in order to ensure the protection of workers, neighboring facilities, as well as the nearby lake. The decommissioning of the buildings included the abatement of asbestos, mercury, polychlorinated biphenyls and hydrocarbons. 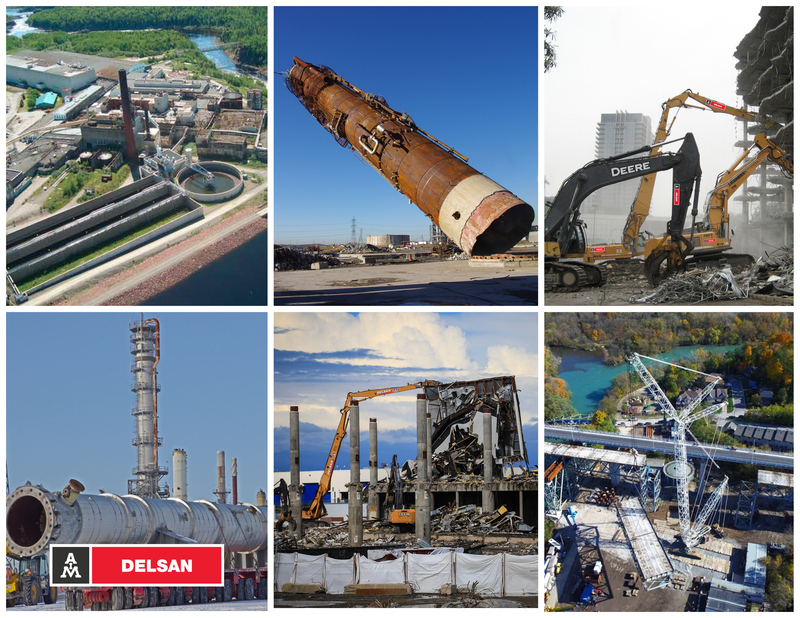 / DEMOLITION Upon completion of the decommissioning activities, Delsan AIM demolished the structures mechanically in accordance with engineered guidelines, using excavators equipped with specialized attachments including a high-reach boom. / EXTENSIVE ENGINEERING Since the height of the concrete chimney exceeded the operating range of conventional equipment, Delsan AIM worked in close collaboration with the general contractor in order to obtain approval from the utility operator to utilize explosives to cause the rapid and progressive failure of this structure in a predetermined direction.The approval process for this work required the preparation of a detail blast plan, which included measures to temporarily shut-down a steam line and to protect both station personnel and operating facilities. The plan included detailed engineering for the pre-blast preparatory work; a pre-blast survey as well as vibration and overpressure prediction modelling in order to ensure that the levels would be acceptable and that there would be no adverse impact to critical infrastructures. / SAFETY FIRST The demolition of the stack was safely executed in accordance with the plan. Environmental monitoring of vibration and overpressure levels were conducted during the blasting operation and found to be within the predicted ranges.